The development of the modern Olympic bow can be seen as a progression, in stages, from the primitive sticks that our Stone Age ancestors used to the decked-out bow we see in target competitions. While the basic technique used to shoot any of those bows remains essentially timeless, the bows have certainly gone through greater changes. As a starting point I’ll take Otzi the prehistoric Iceman, who lived 5,000 years ago and whose body was found in the Alps between Austria and Italy. His bow was 1.82 metres long and made of Yew. This is the wood famously used in the construction of the English Longbow, although others were also used. The stave used contains a strip of the heartwood attached to a strip of the sapwood. When a bow bends, the outside of the curve is going to undergo stretching while the inside will be compressed. The outer wood will be the sapwood which can resist tension and the inner part will be the heartwood which can tolerate compression. The use of the wood is this way avoids the need for using two different materials but has the benefits of a composite construction. Composite technology is thought to have originated on the Asian plains before 2,000 BC. Here the wood is layered with horn on the inside and sinew on the outside. The horn resists compression and the sinew, tension. While the limbs of the earlier bows were predominantly straight, the use of composite technology allowed the further development of recurved limbs. These are limbs where the ends bend back the opposite direction, away from the archer.The limb tips, siyahs, are rigid levers that help to bend the working parts of the limbs. This allows the bows to be smaller for the same draw weight, facilitating their use on horseback. 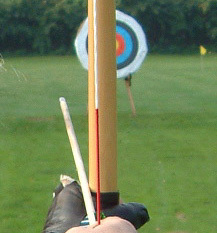 These bows are often known as horsebows. A feature of the recurve design is that they store more energy when drawn. These two characteristics had enormous military advantages and, in part, allowed for the establishment of the largest contiguous land empire in history, the Mongol Empire. The Roman legions used archers which shot recurved bows. These were made mainly of wood, sinew and horn with a reinforced grip area to prevent bending while the siyahs were made of antler or bone. This picture of a Roman bow from the British Museum shows the construction. So far, both these types of bow have been shot off the hand, the arrows resting on the archers hand until the bow provides the propulsion. The next step in the development of technology is where the riser (also known as the handle) of the bow could be cut into to allow the arrow to rest on it. It would also allow the archer to ‘look through’ the bow and along the line of the arrow in situations where the bow is held upright. Now so far we have avoided mentioning arrows, the necessary ‘other part’ of the system. Here we need to introduce the concept of ‘Archers Paradox’ before we progress any further. A paradox is an apparent contradiction. The paradox is this case is that although an arrow may be pointed in one direction, it ends up flying off in another. For an English Longbow, shot off the hand the arrow is going to be lying to one side of the bow handle and therefore pointed off to the side. The archer is however aiming along the line the string will take and once chosen correctly, the arrow will impact along that line of sight. This is possible because the arrow buckles under the force it receives from the loose and this sets up flexing in the shaft that looks like a fish swimming. How much the arrow initially buckles determines the horizontal line at which it flies off, as the arrow in effect bends around the bow; it doesn’t slide past as you’d imagine. The more the initial bending the more to the right the arrow will fly (for a right-handed archer). The less it bends the more to the left it will fly. An arrow that flies to the left is known as ‘stiff’ relative to an arrow of the correct poundage which would fly straight. An arrow that goes right is called ‘weak’. There is a more detailed explanation of all that here. A bow that is cut in to it’s centre or even beyond will be able to shoot a stiffer arrow than otherwise as the arrow doesn’t have to bend around the riser as much. A stiffer arrow will generally be heavier, an advantage when you’re hunting. Because the window can be built out again to varying degrees by adding layers of leather, or other material, you can shoot a greater variety of arrow spines. Here we can see two types of one-piece bows known as ‘longbows’. The English Longbow is the one that is second and fifth from the left. A grip of leather is stitched around it make it more comfortable to shoot. The other bows are known as American Flat Bows or longbows also. The English Longbow has a D profile in cross-section whereas the American Flat Bow is….. flat. The sight window can be seen in the Flat Bows with some leather to act as a resting place for the arrow on the horizontal shelf and as a strike plate on the vertical side of the window. Cutting a section out of a handle to form a sight window is going to weaken the handle and make the bow more likely to break, so the degree to which the window is recessed depends on the strength of the wood or the ability to strengthen the wood with another material, perhaps carbon or fibreglass. Here we see a basic cut-to-centre beginners riser on the left with a Border Black Douglas riser on the right. The Black Douglas Triple Composite Spined Hybrid riser (TCS) are properly reflexed to enhance shooting stability and reduce the effects of release induced torque and also that imposed by variations on bow hand pressure. The TCS construction gives this range of risers surprising stiffness. This residual strength enables these risers to be cut over centre by a massive 5/16″ rivaling alloy risers. This over-centre gives the TCS construction all of the benefits of alloy risers, strength stability and all of the tune adjustment, including the use of plunger buttons if needed plus the warmth and remarkable looks of exotic wood. Both use a similar attachment system to bolt the limbs onto the riser as the limbs can be removed and limbs of a different poundage attached. With the development of metal risers came the innovation to use an attachment system that allows the limbs to be attached at slightly different angles to the riser giving an ability to vary the bow poundage slightly. This allows even greater ability to tune an arrow to the bow and thus the ILF system was born, the brain child of Earl Hoyt, whose legacy lives on in those limbs and risers that bear his name. ILF stands for International Limb Fit, and it allows archers to combine riser and limbs from different manufacturers to customise their bows. The ability to cut beyond centre with a metal riser facilitates the use of a plunger which allows the closer tuning of arrows to the bow. The ability to put bushings into metal risers without dangerously weakening them allows for the use stabilisers and sights. So if we add all that together what do we get?